Popularly called ‘stroke’ or ‘fit’. A sudden loss of consciousness followed by paralysis, due to brain hemorrhage or blocking of an artery of the brain by a blood clot. Sudden attacks of congestion in young and robust persons, especially after fright or sudden shocking events. Face red, pulse full, rapid, throbbing carotids, paralysis of tongue, difficulty in swallowing. Often one cheek red and hot, the other pale and cold. Arnica is the chief remedy in apoplexy because of its great power to produce absorption of extravasated blood. First remedy in apoplexy due to fall or any mechanical injury. Paralysis of limbs, especially of left side. Stertorous (deep snoring breathing) breathing. Soreness and aching all over the body. Involuntary discharge of urine and feces. It is a remedy to promote threatened apoplexy. Often attacks of apoplexy can be prevented by restoring the circulation to its equilibrium (a state of balance) by remedies like Aconite, Belladonna, Glonoine and Arnica. Arnica should be given when sensibility is recovered. Great redness of the face with congestion in the head, loss of consciousness, convulsive symptoms, dilated pupils, pulse full and rapid, involuntary urination, throbbing of carotids, paralysis of limbs, right side. Bell. should be given every 15 minutes till attack ceases. Deep red flushed face, stertorous (deep snoring) breathing, convulsions, unconsciousness, eyes blood-shot and half open. Sometimes a tetanic rigidity of the body and paralysis. Pulse is exceedingly slow and full. Drooping of the lower jaw. Skin covered with hot sweat. There is no response to light, touch, noise. When apoplexy occurs suddenly without warning. The patient falls suddenly into a comatose state out of which he cannot be aroused. Palpitation of heart, cold moist skin and convulsions of the facial muscles. Apoplexy followed by more or less severe paralysis, especially in old people. Apoplexy of old people and drunkards. Paralysis of limbs, with trembling, of right side or general. 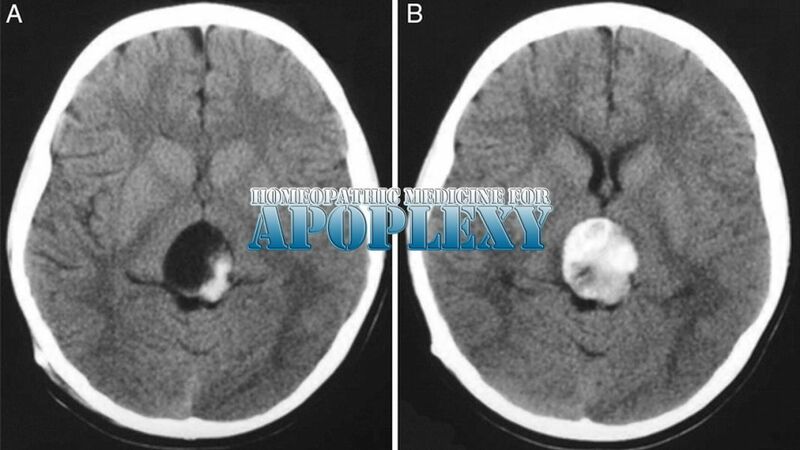 Apoplexy associated with convulsions. Sudden falling down with a shriek. Soporous condition. Face red, lower jaw dropped. Pulse weak and full. Numbness of hands after consciousness returns. Apoplexy with convulsions, followed by paralysis. Head hot, face red, feet cold. Paralytic state remaining after the apoplexy is removed. Paralysis and contraction of the lower extremities. Apoplexy preceded by vertigo, nausea, convulsive motions of eyes, paralysis of right or left extremities. Face red and hot, eyes closed with balls constantly rolling about, pupils dilated, stupor. Headache as if skull would burst. Pain as if opening and shutting in occiput and nape. Threatened or actual apoplexy, with stupor. Great heaviness of eye-lids, giddiness. Pulse slow, full but soft, vertigo. Intense heat, cold extremities, stertorous breathing and coma are important symptoms. Throbbing headache, seems to arise from neck. Throbbing in front of head, temples. Apoplexy of drunkards, of high livers. Attack preceded by vertigo, nausea, buzzing in ears, headaches. Stupefaction, stertorous breathing, dimness of vision. Paralysis, especially of the lower limbs, hanging down of the lower jaw. Face pale, head hot, mouth distorted, pulse quick, hard. Apoplexy in drunkards, broken down constitution, following toxemia (poisoned state of blood) state. Burning fever and accelerated pulse, loss of speech. Sopor from which the patient cannot be aroused. Paralysis following apoplexy, especially right side. This remedy is useful in serious and nervous apoplexy. Headache as if bruised all through bones of head. Apoplexy, especially after injury to head. Severe pain in head as if it would split. Brain feels loose, when stooping. Pulse and respiration lost. Face red, but cool on touch. Mouth drawn to left. Stupor complete or partial. Lies on back, eyes partly open or wide open. Insensible to light. Rolls head, bores into pillow. Automatic motion of one arm and one leg. Obscuration of the eyes, as if fog before the eyes.